The Chuckit! Amphibious Bumper Dog toy provides a lot of outdoor play! It is a high quality floating and flying toy designed for active dogs that love being in the water, complete with rope for easy throwing. The bumper is a sturdy but soft training dummy constructed of tooth-rugged nylon and memory foam that allows it to sail through the air and float high on water. 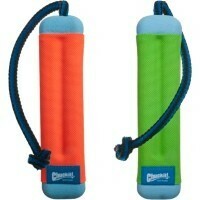 Designed for long lasting, it is strong and tough yet easy on your dog’s mouth. The Chuckit! Amphibious Bumper is easy to spot with its bright colours and in certain areas are rubber lined, providing better grip for you and your dog. Great idea and helps to keep my dog focused while on walks however the rope pulled out of the end on its second outing when my dog pulled on it so it isn't very well made.